Blender coffee is a happy part of my morning; it's even my motivation to get out of bed on some days. Several months ago, I read about Bulletproof coffee, and I was instantly hooked. Then, I started experimenting to make a delicious blender coffee all my own, which coincidentally others have been doing, too. Don't want to drink coffee but love the ritual of a hot drink in the morning? Try Teeccino. 2 C (fits perfectly in my to-go coffee mug) brewed coffee. Currently, our coffee of choice is Cameron's. 2 dashes nutmeg, pumpkin spice, cinnamon, etc. 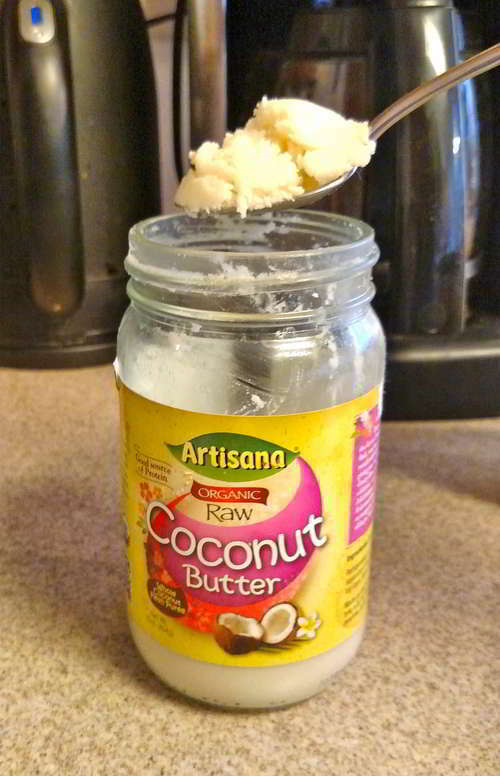 1 heaping teaspoon of coconut butter like Artisana or 1/2 C nut or seed milk, or 1 TBS unsalted organic pastured butter or butter from grass fed cows like Kerrygold. Sweeter such as liquid vanilla stevia (I put in about 5 drops), 1 heaping tsp raw organic honey, coconut sugar or any other preferred sweetener (optional). 1 heaping teaspoon of cacao powder (optional). I'm currently using Savory Mexican Cacao that I recently purchased while in Orange County. 1. 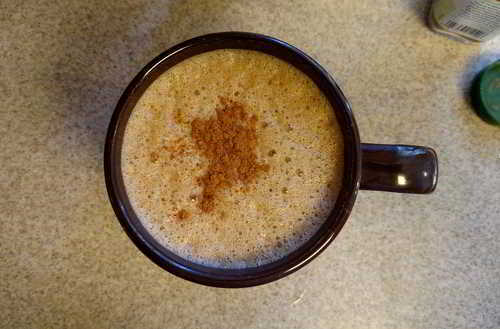 Add a dash of cayenne to the coffee grounds and brew desired amount of coffee. 2. Pour 2 Cups of brewed coffee into blender like Vitamix . 3. Add heaping teaspoon of coconut butter, optional cacao powder, desired spices and sweeteners. 4. Blend for 20 seconds on high. Turn off blender and watch a foamy top form. Oh yeah! 5. Pour frothy liquid gold into to-go coffee mug or giant coffee cup. Sprinkle with cinnamon, cacao, or your preferred spice if you'd like. 6. Enjoy the best cup of coffee you'll ever have, at a fraction of the cost of a coffee shop. Cayenne: improves circulation, aids digestion by stimulating gastric juices, reduces inflammation, heats up your body and improves metabolism. Coconut: although high in saturated fat, coconut is comprised of medium-chain fatty acids (MCFAs, aka medium chain triglycerides, or MCTs). Unlike other saturated fats, which are long-chain fatty acids, coconut is quickly and efficiently absorbed. Since "MCFAs are readily utilized by the liver, it leads to greater energy expenditure and enhancement of thermogenesis" (fat burning). So, MCTs are efficiently absorbed and quickly turned into energy, while also providing satiation. Additionally, coconut is antiviral, antibacterial, and anti-fungal. Coffee: the debate over whether coffee is good or bad for you continues. However, I recommend using the highest quality, organic coffee you can, as it will have reduced exposure to pesticides. Fair trade coffee (and cacao) is even better, as those who produce these products are fairly compensated, with a portion of profits going back into the communities from where they come. Cacao: can help stabilize blood pressure and lower cholesterol with its powerful phytochemicals. Cinnamon: can help stabilize blood sugar, boosts cognitive function and memory, has anti-fungal properties and can lower your bad cholesterol (LDL). It is also a warming spice, just like cayenne, which warms the body and stimulates metabolism.